Mom's old fashioned elderberry pie recipe is easy as pie to make. Sorry about the pun folks, but you'll love these awesome homemade fruit pies. When I was a boy, we were fortunate to have a clump of wild elderberry bushes growing near the creek on our farm, and Mom used their purple-black ripened fruit to make beautiful homemade pies. Sometimes she canned a jar or two of the elderberries so we could enjoy a special fruit pie around Christmas time. What a treat! Elderberry pie is one of my favorites, especially when served with a big scoopful of homemade vanilla ice cream. Perfection! Our friend Louise is the current owner of our old farm, and she enjoys harvesting those same elderberry bushes for her pie making and preserving needs. She says they still bear delicious fruit every year. These fruit-filled pies sometimes tend to be juicy, so be sure to sprinkle some flour over the filling before adding the upper crust. Wash and drain the berries. Stir sugar well into fruit and turn into a pie pan lined with crust. Sprinkle a little flour over the filling to absorb juice, and cover with an upper crust. Bake for 40 minutes (450°F for 15 minutes; 425°F for 25 minutes). Serve cold with a little sugar sifted over top. 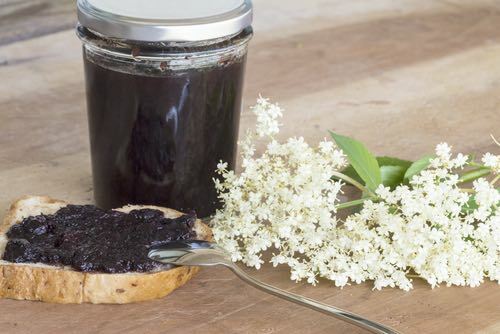 Elderberries are easily preserved for making pies in winter or for spreading on fresh bread or scones for a quick-and-easy table dessert. Wash selected elderberries in cold water and drain in colander. Pack the berries in sterilized jars. Fill with hot syrup (1/4 cup of sugar to 1 cup of water). Steam until tender with jar tops loosely covered. Fill jars with boiling syrup, apply rubber rings, and seal. Cover equal quantities of elderberries and cut crabapples with water and cook until entirely soft. Mash so that fruit is thoroughly broken up. Strain the juice through a jelly bag. Boil juice 10 to 20 minutes and test for pectin. Add 3/4 cup of sugar to 1 cup of juice and allow to boil gently for 8 to 10 minutes. Place juice in sterile glasses and let stand until cold. Cover with paraffin. 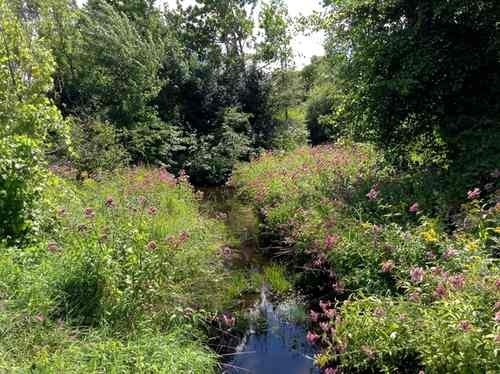 My wife and I live nearby the old farm where I was raised, and alongside the creek flowing next to our house (above), we have a wild elderberry bush which we make use of in season, and we have sometimes driven along country roads looking for elderberry bushes growing in roadside ditches — nature's bounty. 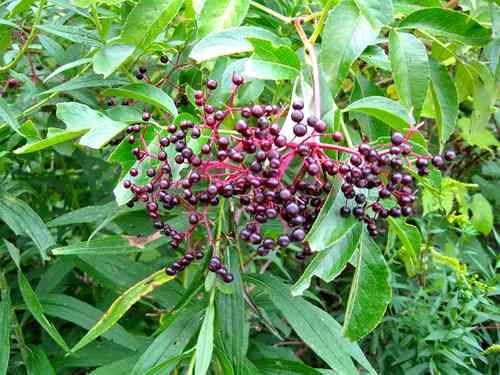 The common North American elderberry (Sambucus canadensis) is easy shrub to spot once you become familiar with its leafy appearance and clusters of fruit. The fruit is fully ripe by mid-to-late summer. You need to pick elderberries quickly, though, before the birds beat you to it. The cluster pictured below has already been picked at by birds. 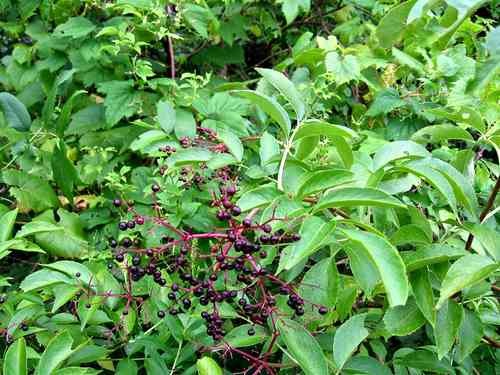 It is possible to grow wild elderberries at home in your garden, but they can be difficult to transplant, and they need sufficient moisture to grow. 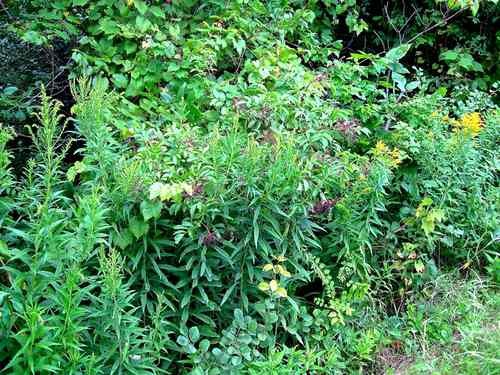 However, if you're looking for plants or cuttings to transplant, you'll find elderberries growing wild throughout much of eastern North America and some parts of Europe, often near creeks and areas of moist soil. Early spring is the recommended time for planting. An excellent Fact Sheet on Elderberries for Home Gardens can be found on the Ontario Ministry of Agriculture and Food website. Elderberries are rarely found for sale in farmer's markets and supermarkets since they are not a significant commercial crop, yet it is worth watching for them when they're in season. Dried elderberries can be found at health food stores as an alternative, and they can be used in homemade elderberry pie recipes.